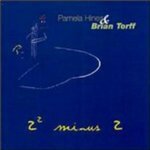 Brian Torff composed "Apathy Rains"
Hines, Pamela and Torff, Brian Q., "2 Squared Minus 2 (CD)" (2000). Visual & Performing Arts Faculty Music Gallery. 16.